Another one growing on the granite rocks above high watermark on a north west facing beach on the Isles of Scilly. 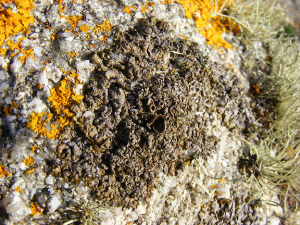 This one is quite an ugly lichen, warty and blackish, looking like dark wormcasts. It has several large open cup shaped features which might be fruiting bodies. It is growing in the company of orange foliose and silver green fruticose lichens.